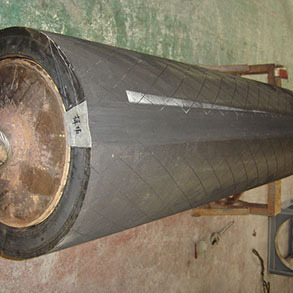 Wuxi Aomeite is capable of applying a myriad of elastomers to your rollers. Our elastomers include Fluoro-elastomer(FKM/Viton), EPDM, NBR, and Silicone Rubber. Over fifty years ago, the aerospace industry was in need of a high-performance elastomer. Fluoroelastomers were then created to satisfy these performance requirements. Today, fluoroelastomers have spread to countless other industries. Whether its the automotive, fluid power, oil, appliance, or chemical industry, fluoroelastomers can handle the job. These past fifty years have allowed fluoroelastomers to build a reputations for unparalleled performance in extreme temperatures and highly corrosive environments. This high-performance synthetic rubber has properties that allow for outstanding functionality when working with aggressively corrosive chemicals and fuels. FKM can also has significant temperature resistance.